In a large frying pan, with a bit of coconut oil, brown the onion for about 4 minutes. Add all the other ingredients and simmer for 30 minutes. Taste the sauce and adjust with more smoked paprika, vinegar or hot sauce to the desired taste. Grind the dried mushrooms in a coffee grinder to a powder. Mix that powder in a bowl with the melted coconut oil. Clean your turkey and pat dry. Check the body and neck cavities. 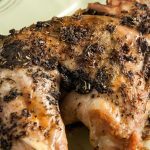 Season the bird generously with garlic powder, dried thyme, the fresh herbs or poultry mix and black pepper. Spread the rest of the mushroom butter on the surface of the turkey. Place a sheet of foil loosely over the turkey and put it in the oven. Baste the bird about every 20 minutes to make sure the meat stays moist. 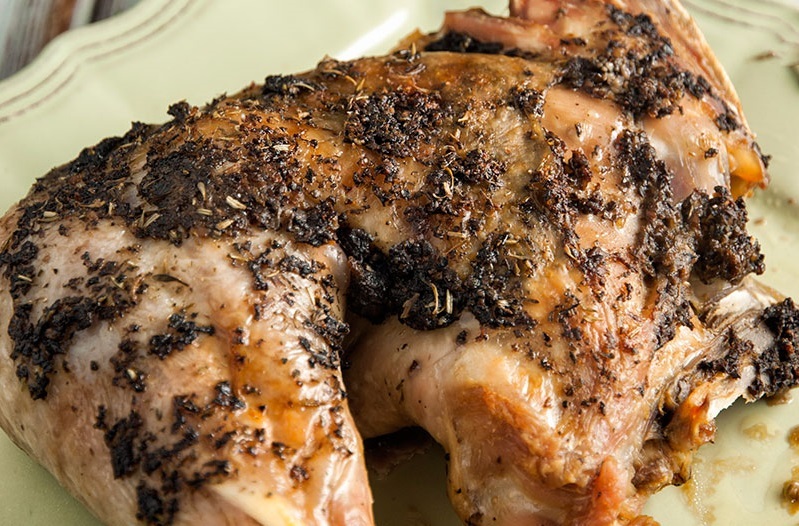 You can remove the aluminum foil an hour before the end of the cooking process to obtain a golden and crispy skin. Remove the turkey from the oven when fully cooked. Take it out of the roasting pan and set aside, cover it.